CNBC Africa – the pan-African financial and business news channel –will be syndicating its award-winning multimedia and video clips to Newstag, an innovative ‘mobile-first’ video news service. The multi-year deal grants Newstag the right to share and distribute CNBC’s news videos on its mobile and online platforms alongside current affairs and entertainment content from other professional content producers around the world, including AP, AFP and Reuters. Newstag’s ‘mobile-first’ service enables users to create their own ‘tagstream’ (or personalised TV channel) in seconds, organising, consuming and sharing stories among their social networks using the latest web and mobile technologies. These stories are available from a number of different perspectives, resulting in a platform that allows converging viewpoints to be presented side by side, shedding new light on international news as it breaks. Launched on 1 June 2007, CNBC Africa celebrates its 8th anniversary as Africa’s first and only real-time Pan Africa financial and business news network. Part of the global CNBC family, which reports around the clock from major financial centres worldwide, CNBC Africa covers business and financial markets news from across the continent, telling the story of Africa on the move. Since the channel’s launch, CNBC Africa has been breaking ground across the African continent and amongst many successes and achievements, is the only pan-African television network to report live each day across Africa. The combined reach of CNBC Africa and its affiliated networks is 390 million viewers around the world. Its reach on the African continent has been growing by the day through its distribution partnership with MultiChoice. CNBC Africa has grown beyond all expectations since it was launched eight years ago, and everyone on the CNBC Africa team is justifiably proud of the respected media brand that they have all helped to create. 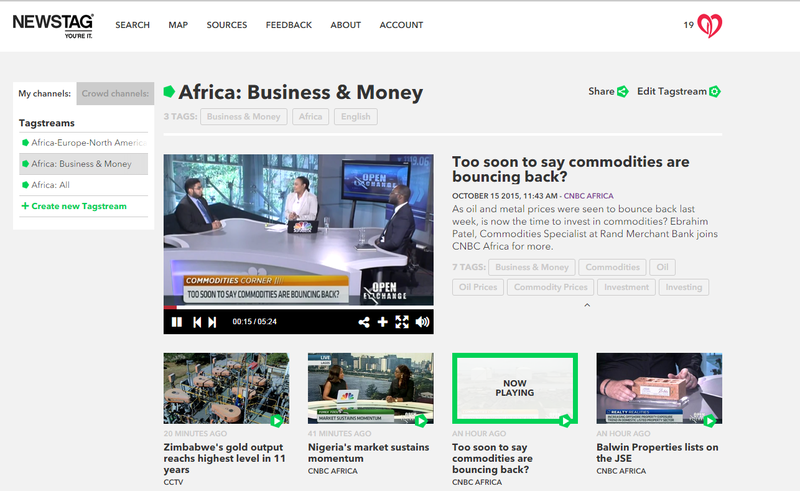 Through accurate and incisive reporting and analysis, and an attractive and dynamic programme schedule, CNBC Africa has clearly positioned itself as the premier African news and information resource for CEOs and senior corporate executives, financial houses, investors and aspirational viewers across the continent. This announcement follows Newstag’s selection as a top international start-up by Mobile World Capital Barcelona in an international contest to recognise the most innovative use of mobile technology in business. In addition to this, Newstag has recently been nominated for ‘best international news site’ by WAN-IFRA alongside Business Week and Singapore Press Holdings.